Posted on Thursday, February 24th, 2011 at 3:49 am. One of the first rules of blogging is if the universe gives you feedback and the feedback is strong (negative or positive), you should talk about it to prove to your audience of 39 people (thanks for the cold-water-in-the-face reality check, Twitter) that someone is listening. I haven’t been good at keeping that rule lately. There’s a lot going on in my personal life and sometimes I choose sleep and chores over blogging. Shocking. Perhaps sad. But true. 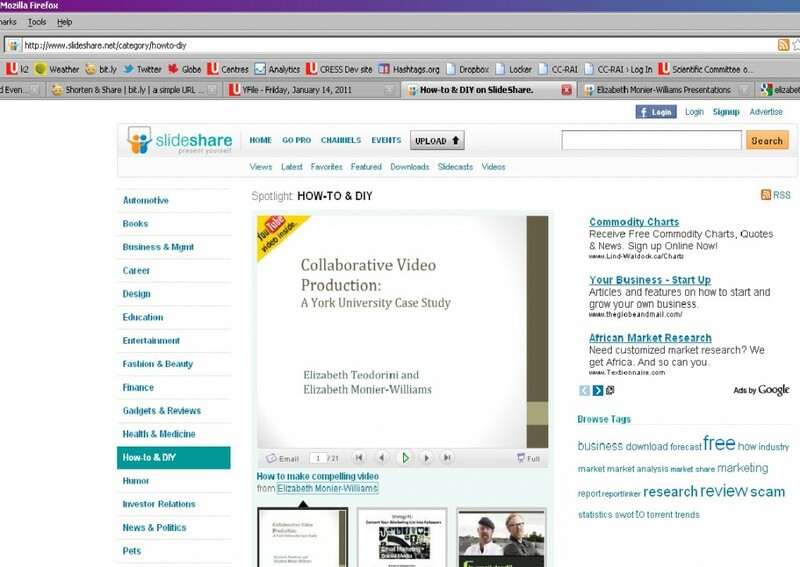 So back in January, I posted the talk Liz Teodorini and I did on collaborative video production on Slidehare, and I blogged about the process. Closer to home, University Affairs (which is like The Chronicle of Higher Education only Canadian in focus) picked up my post in their feed and retweeted it. You can see the modest retweet thread that spawned on Topsy (there is also a link to the thread in the comments of the original post, which is one of Topsy’s more useful features if you’re tracking blogging uptake). 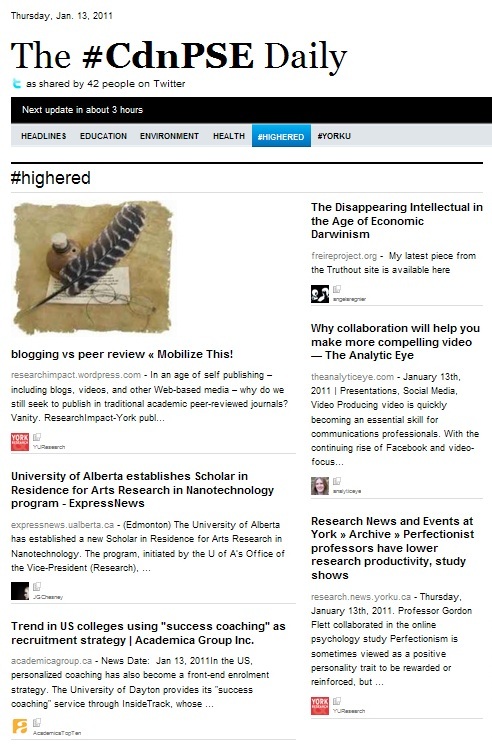 That same week, a couple of my tweets through @YUResearch enjoyed particularly strong reach (mostly due to the strength of a post my colleagues in Knowledge Mobilization at York did about the merits of peer-reviewed publications versus blogging). Although I question the merit and energy folk devote into setting paper.li applications up (I don′t find it an easier method to digest information than Tweetdeck′s neat columns, but I am not a visual learner), it was flattering to see my stuff in one. While I did do some retweeting through @analyticeye when all of this feedback happened, I didn’t take the time to post any analysis of what happened. Sometimes it feels repetitive to revisit a topic so soon after the initial post. Sometimes it feels like shameless self-promotion. In this case, it’s probably a bit of both. But in the days of long tail Internet content, if you’re serious about building a blog, watching what happens after you raise a topic and communicating the outcome to your audience is equally, if not more, important than the original post. So there you have it: the momentum post that should have been in lieu of newer thoughts. With luck, some of those will follow next week.